The complex Fresnel reflection coefficients rp and rs of p- and s-polarized light and their ratio ρ=rp/rs at the pseudo-Brewster angle (PBA) ϕpB of a dielectric–conductor interface are evaluated for all possible values of the complex relative dielectric function ε=|ε|exp(−jθ)=εr−jεi, εi>0 that share the same ϕpB. Complex-plane trajectories of rp, rs, and ρ at the PBA are presented at discrete values of ϕpB from 5° to 85° in equal steps of 5° as θ is increased from 0° to 180°. It is shown that for ϕpB>70° (high-reflectance metals in the IR) rp at the PBA is essentially pure negative imaginary and the reflection phase shift δp=arg(rp)≈−90°. In the domain of fractional optical constants (vacuum UV or light incidence from a high-refractive-index immersion medium) 0<ϕpB<45° and rp is pure real negative (δp=π) when θ=tan−1(cos(2ϕpB)), and the corresponding locus of ε in the complex plane is obtained. In the limit of εi=0, εr<0 (interface between a dielectric and plasmonic medium) the total reflection phase shifts δp, δs, Δ=δp−δs=arg(ρ) are also determined as functions of ϕpB. 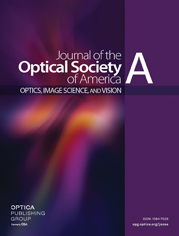 S. P. F. Humphreys-Owen, “Comparison of reflection methods for measuring optical constants without polarimetric analysis, and proposal for new methods based on the Brewster angle,” Proc. Phys. Soc. London 77, 949–957 (1961). H. B. Holl, “Specular reflection and characteristics of reflected light,” J. Opt. Soc. Am. 57, 683–690 (1967). G. P. Ohman, “The pseudo-Brewster angle,” IEEE Trans. Antennas Propag. 25, 903–904 (1977). R. M. A. Azzam, “Maximum minimum reflectance of parallel-polarized light at interfaces between transparent and absorbing media,” J. Opt. Soc. Am. 73, 959–962 (1983). S. Y. Kim and K. Vedam, “Analytic solution of the pseudo-Brewster angle,” J. Opt. Soc. Am. A 3, 1772–1773 (1986). T. E. Darcie and M. S. Whalen, “Determination of optical constants using pseudo-Brewster angle and normal-incidence reflectance,” Appl. Opt. 23, 1130–1131 (1984). Y. Lu and A. Penzkofer, “Optical constants measurements of strongly absorbing media,” Appl. Opt. 25, 221–225 (1986). R. M. A. Azzam and E. Ugbo, “Contours of constant pseudo-Brewster angle in the complex ε plane and an analytical method for the determination of optical constants,” Appl. Opt. 28, 5222–5228 (1989). M. A. Ali, J. Moghaddasi, and S. A. Ahmed, “Optical properties of cooled rhodamine B in ethanol,” J. Opt. Soc. Am. B 8, 1807–1810 (1991). R. M. A. Azzam, “Analytical determination of the complex dielectric function of an absorbing medium from two angles of incidence of minimum parallel reflectance,” J. Opt. Soc. Am. A 6, 1213–1216 (1989). I. H. Campbell and P. M. Fauchet, “Temporal reshaping of ultrashort laser pulses after reflection from GaAs at Brewster’s angle,” Opt. Lett. 13, 634–636 (1988). Y. Lv, Z. Wang, Y. Jin, M. Cao, L. Han, P. Zhang, H. Li, H. Gao, and F. Li, “Spin polarization separation of light reflected at Brewster angle,” Opt. Lett. 37, 984–986 (2012). R. M. A. Azzam and N. M. Bashara, Ellipsometry and Polarized Light (North-Holland, 1987). R. M. A. Azzam and A. Alsamman, “Plurality of principal angles for a given pseudo-Brewster angle when polarized light is reflected at a dielectric-conductor interface,” J. Opt. Soc. Am. A 25, 2858–2864 (2008). R. M. A. Azzam and E. Ugbo, “Angular range for reflection of p-polarized light at the surface of an absorbing medium with reflectance below that at normal incidence,” J. Opt. Soc. Am. A 19, 112–115 (2002). A. Alù, M. G. Silveirinha, A. Salandrino, and N. Engheta, “Epsilon-near-zero metamaterials and electromagnetic sources: tailoring the radiation phase pattern,” Phys. Rev. B 75, 155410 (2007). R. M. A. Azzam, “Direct relation between Fresnel’s interface reflection coefficients for the parallel and perpendicular polarizations,” J. Opt. Soc. Am. 69, 1007–1016 (1979). R. M. A. Azzam, “Reflection of an electromagnetic plane wave with 0 or π phase shift at the surface of an absorbing medium,” J. Opt. Soc. Am. 69, 487–488 (1979). Fig. 1. Complex-plane trajectories of rp at discrete values of the PBA ϕpB from 5° to 85° in equal steps of 5° as θ=−arg(ε) covers the full range 0°≤θ≤180°. Fig. 2. Graph of the function of Eq. (5). Both ϕpB and θ are in degrees. Fig. 3. Locus of all possible values of complex ε such that δp=arg(rp)=π at the PBA. Fig. 4. Total reflection phase shifts δp, δs, and Δ=δp−δs+360° at the interface between a dielectric and plasmonic medium in the limit as θ→180° (εi=0,εr<0) are plotted as a functions of ϕpB. All angles are in degrees. Fig. 5. Family of δp versus θ curves for ϕpB from 10° to 40° in equal steps of 10°. Both θ and δp are in degrees. Fig. 6. Family of δp versus θ curves for ϕpB from 45° to 85° in equal steps of 5°. Both θ and δp are in degrees. Fig. 7. Complex-plane contours of rs at discrete values of the PBA ϕpB from 5° to 85° in equal steps of 5° as θ=−arg(ε) covers the full range from 0° to 180°. Fig. 8. Complex-plane trajectories of the ratio ρ=rp/rs at discrete values of the PBA ϕpB from 5° to 85° in equal steps of 5° as θ=−arg(ε) covers the full range 0°≤θ≤180°. (2) rs=cos ϕ−(ε−sin2 ϕ)1/2cos ϕ+(ε−sin2 ϕ)1/2. (4) |ε|=ℓ cos(ς/3),ℓ=2u(1−23u)1/2/(1−u),ς=cos−1[−(1−u)cos θ/(1−23u)3/2],u=sin2 ϕpB,0≤θ≤180°. (7) ρ=rp/rs=sin ϕ tan ϕ−(ε−sin2 ϕ)1/2sin ϕ tan ϕ+(ε−sin2 ϕ)1/2.